SOLUTION: Error 31 means the game cannot find a particular file... Try re-installing. -DO NOT SEE INTRO LOGO OR MOVIE or GET "ERROR 58"
SOLUTION: You should see an intro WRF Studios Logo and intro Movie... if not... your system cannot play movie files. Some users have experienced video animation playback issues due to incorrectly installed "Cinepak Codec" driver. We have to put that disclaimer in there since we are not familar with your level of experience or the particulars with your current system. 1. Some users needed to uninstall ANY additional Codec paks installed on their system. 2. Some users also needed to re-install CinePak Codec on their system. VERY IMPORTANT: After you Download and install - A new "CINEPAK" icon will appear on your desktop... click it... and a registry warning window will appear... click ok or yes then a new registry window will appear stating that registry has been successfully updated. Then examine bottles over entrance doorway. Take the BOTTLE OF OLIVE OIL. Examine TV and use FIXED TV KNOB on TV... turn knob to turn on TV... Remember the TV guide? - remember how stations with channel 7 where hi-lighted?... turn to channel 7 - still no reception... may you need to adjust antenna? Click up on tv screen to adjust antenna. To the LEFT is a river area... to the RIGHT is the entrance to the Pier/wharf area... FORWARD is the entrance to the house and BACK takes you to the cemetery. Once you try exiting boat... you will hear a man shouting "Get out of that Boat!" Examine and open trash can... Take the PIECES OF CARDBOARD then examine them... Strange... they are just covered with black and white dots. Arrange cardboard pieces inside frame. See what it says... this must be the missing section from the cut box of cereal - remember how the box of cereal says... "Can you see the hidden phrase"
BUT WAIT!!!!!! There's few pieces missing - as if someone cut out several letters - but why? Look at the dresser - open drawer and READ HANKS JOURNAL - a necessary read for a few things to make sense. Which website should you go to? Remember the TV? Remember that it showed a website address? Type in the website address shown from fixed TV in house. Hmmmm... These must be the missing letters Hank cut out to create a clever way to hide his password from prying eyes huh? With these missing letters you should be able to figure out the first 2 lines of the "Hidden Phrase"
NOTE: The 2 lines much be entered EXACTLY correct with no extra spaces or any punctuation. After the 2 lines of the hidden phrase are entered... it asks for a password... using the TOY on cardboard from side of computer... you know it.... Enter it to read Hank's E-Mail. After reading one of Hank's emails you may have figured out a way into his locker (his key broke off in the lock- so you are not getting in the regular way) - His friend suggests going in through HIS locker (since there is a hole between Hank's and Hanks friends locker) - "He can fish anything he might need out that way"
Exit the computer and enter the boat house - examine the locker area and enter the combination provided by Hank's friend. Exit boathouse and go back into Hank's Hut and use KEY on COMPUTER DESK DRAWER... Take the poem Hank wrote about his wife. Remember what the paper in the closet showed? Remember the diagram and what was written in the NOTEBOOK? (from inside actual game package) - Swap the puzzle pieces - Move the tall puzzle pieces where the short puzzles pieces are and visa versa. This is located above the boiler room and requires you to light the boiler and turn the valves below in order to unlock this machine. 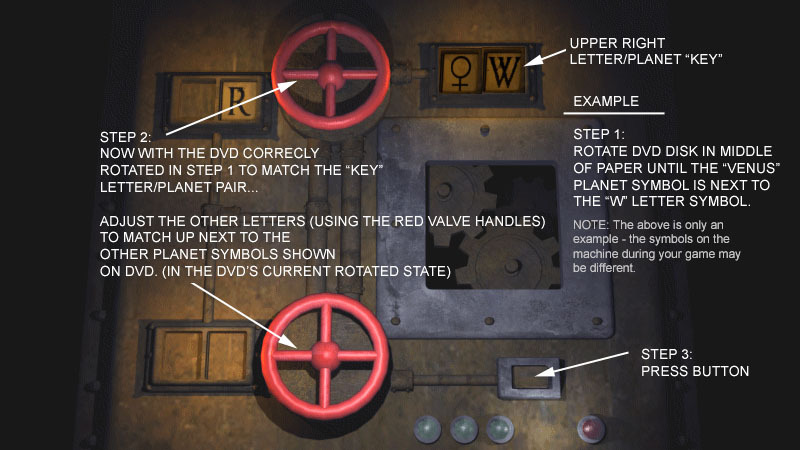 (see above) - Once the valve handles are unlocked you are ready to do this puzzle. HINT: Notice how the 2 handles move only the 2 left side symbols? The other symbols on the upper-right must be some sort of "key"
HINT: Notice how the DVD fits perfectly into the center circle on the strange piece of paper included with the game? HINT: Hmmmmm... if you rotate the DVD it sort of makes similar PLANET/LETTER pairs like shown in the windows of the machine huh? Maybe you should re-read the Hank's poem to his wife. I think you know what to spell now, right? The lift sways but won't move down... Perhaps the secret once again lies in Hank's poem (He really wanted to make if difficult for any thieves to find his wife) - You will need to go back into the house and into the kitchen - use the BUCKET on the sink - then come back to lift and use the BUCKET WITH WATER on vase. This room looks like some sort of control room... but what does it control? Move closer to control panel - You have no idea what or how to work these controls... better go BACK and look at the sign posted above the control panel. Notice the instruction written on it? Ok... Good now you know how to start the generator. But it wont start... better go BACK and click on the LEFT side of room near the GENERATOR FUEL TANK then use the FUEL CAN on the SPOUT to fill up fuel tank for generator... now go back to control panel and make sure controls are set as shown in instructions on sign above control panel. Examine Top shelf near doorway to find the Scorpion guarding a small key. If you attempt to take the key... the scorpion will back up preventing you from taking it. Perhaps you could "lure it away" from the key. Use the MAGGOT and place it in front of the scorpion. That should keep him busy while you take the SMALL KEY. Look on the top shelf to the LEFT to find a small basket container... I think the SCORPION'S KEY might fit here. Yes... but you never know what lurks in a swamp witches shack do you? Examine inside the basket and take HANK'S FISHING LICENSE - turn it over and read the back side.... Talk with the swamp witch.... She will tell you to take the MYSTERIOUS BOX from the bookcase. This puzzle contains tiles that must be moved to create a match of 3 symbols. Once each match of 3 symbols is completed the tiles symbols are erased. Match all symbols to reveal a secret compartment containing a KEY. Take the key and open the drawer... Take the BAG OF ORBS. (but one is missing) - You must examine the PICTURE in main room. Once you have all the orbs you can click on witch to start orb puzzle. But where do each of the colored orbs go? There's a hint on top of the drawer in other room. Move paper to reveal poem. The poem tells you exactly where each colored orb is positioned on the symbol on floor. Remember that torn page you took from the book in the Doctor's study? You might want to look at it now... I reveals that you must rotate the head to each of the numbers in the same sequence listed on paper. NOTE: It's tricky... because this is not a safe combo... you don't automatically alternate between CLOCKWISE and COUNTER CLOCKWISE after each number. The head lock will reset after a set amount of turns... so you must figure out the most efficient way of turning the head to touch all of the numbers listed on sheet. HOW TO SET THE BOX: Step 1: find out from Tara where each of the three spiders start out... then do the orb puzzle to find out how many spaces the spiders should rotate. Step 2: once the spiders have been rotated... set the box according to the symbols the spiders are now sitting. NOTE: the symbols do not have to be in order... in fact you will notice that the some slots wont show certain symbols at all - you will need to play around in order to get all 3 symbols shown. It looks like someone didn't want anyone to enter this cave... If you try to move forward... large spikes prevent your movement. Take the BROKEN STAFF and POLE. Then examine the upper RIGHT disk. Use the BROKEN POLE in hole. The trap will reset allowing you to pass. Copyrighted 2007 WRF Studios All Rights Reserved.